With the exception of Kamaal Kojandi and the followers of Rumi, no other Sufi group would approach this dance. It has to be noted that this dance called Samaa roots back to ancient times. In fact this dance is a mix of movements, impressions and sounds, which cause trance-like state. In the ancient times Samaa was used to climax the gatherings of people. But in Rumi following and others who subscribed to Samaa, the dance was the commencement of the gatherings. The roots of Samaa are not just found in Iran. Samaa orgies as large as several thousand people were held in Asia Minor, Greece, the islands of Aegean Sea and Rome. There are recorded historical evidence to this claim. In the ancient times mostly women participated in the Samaa dances. Four hundred years before the Birth of Christ, the Roman Senate attempted to ban this dance, however never succeeded in truly suppressing it. The performers migrated to northern and southern vineries for their rituals. In Samaa orgies, sometimes the women were driven into violent states of mind, which caused them to tear their infants apart, by their own teeth. For about four hundred years this form of Samaa proliferated in Asia Minor, Greece and the Western regions of Iran and the southern parts of the Alborz Mountain (Tehran region). The advent of Islam extinguished inhumane parts of Samaa dances and mostly forgotten. However we see that the Samaa infiltrated the Sufi houses of the Asia Minor before other places. Although because of the Naqshbandi Sufi influence Samaa did not roam the Uzbekistan (Russia) area, however the Tabriz (Iran) Samaa had spread roots. Many of the early Sufi movements did not take kindly to Samaa and consider it improper for Muslim ceremonies and actually was forbidden for the most part. During the 6th century of Islam (1300s) we see the beginnings of Samaa dances. We hear stories about Shahriaar Kazerooni breaking his ankle due to excessive dancing in the Sufi school of Khajoo Kermani. First there were movements and reciting poetry and later on music was added. These dances created a state of trance during which the Sufi poets composed their poetry that has lasted to the present day. The purpose of Samaa was to become self-less (like a runner’s high) where the mind would focus on spiritual poetry and performance with the singular goal of praising one God. Indeed the last Sufi school, which has maintained Samaa, is the Rumi’s. 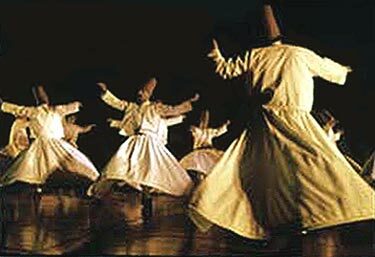 The Westerners saw these dances in Qunieh, Rumi’s headquarters, and called it the Whirling Dervish Dance. Samaa is absent however from the western Arab regions of Middle East. Rumi’s version of Samaa is as following: anchoring the right foot on the ground and whirling with the rhythm of music and waving the arms in the air. Rumi’s school has turned Samaa into an act of worship. In some Sufi schools women dressed as men participated in the Samaa. In some cases the women performed separately. My personal judgment about Samaa is that of caution. Clearly amongst certain sects of religions in Iran Samaa was used to fall into trance and allow spirits to possess bodies. Miraculous acts were performed to enchant the eyes of the spectators. Forms of Sanaa later on infiltrated parts of Western African and brought to Caribbean Islands like Haiti via the slave ships. As a Muslim I do not subscribe to this application of Samaa and consider it as Demon worshiping. However in Rumi’s version if the dance is used to focus one’s mind on the poetry in a worship-like posture, still being cautious I can understand the art form of it. Strict Sunni adherence which I personally enjoy does not find comfort with any form of Samaa simply because we do not find this dancing amongst the traditions of our beloved Prophet Mohammad Peace Be Upon Him. However, there is no 100% religious argument against an art form that produces such magnificent human emotions for the Lord. Allah knows the final truth.